Anteroposterior and lateral radiographs of an L1 osteoporotic wedge compression fracture. An injury to the thoracic or lumbosacral cord would likely result in neural deficits at the trunk, genital area, and lower extremities. Specific syndromes, such as Brown-Séquard syndrome and anterior cord syndrome, may affect a major part of the spinal cord. This mechanism usually results in an anterior wedge compression fracture. As the name implies, the anterior column is compressed, with varying degrees of middle and posterior column insult. See the image below. The precise mechanism of this fracture is a combination of lateral flexion and rotation with or without a component of posterior-anteriorly directed force. The resultant injury pattern is failure of both the posterior and middle columns with varying degrees of anterior column insult. The rotational force is responsible for disruption of the posterior ligaments and articular facet. With sufficient rotational force, the upper vertebral body rotates and carries the superior portion of the lower vertebral body along with it. This causes the radiographic "slice" appearance sometimes seen with these types of injuries. Fluoroscopic view of a kyphoplasty procedure. Patients with vertebral fractures secondary to trauma should be evaluated and treated in a systematic fashion as outlined by advanced trauma life-support protocols. At first, attention should be directed toward the patient's airway, breathing, and circulation (ABC). Clinicians should adhere to cervical spine precautions. The patient can be logrolled off the spinal cord while radiographs are performed. Winkler EA, Yue JK, Birk H, Robinson CK, Manley GT, Dhall SS, et al. Perioperative morbidity and mortality after lumbar trauma in the elderly. Neurosurg Focus. 2015 Oct. 39 (4):E2. [Medline]. Ghanayem AJ, Zdeblick TA. Anterior instrumentation in the management of thoracolumbar burst fractures. Clin Orthop. 1997 Feb. (335):89-100. [Medline]. McAfee PC, Yuan HA, Fredrickson BE, Lubicky JP. The value of computed tomography in thoracolumbar fractures. An analysis of one hundred consecutive cases and a new classification. J Bone Joint Surg Am. 1983 Apr. 65(4):461-73. [Medline]. Haczynski J, Jakimiuk A. Vertebral fractures: a hidden problem of osteoporosis. Med Sci Monit. 2001 Sep-Oct. 7(5):1108-17. [Medline]. Qaseem A, Snow V, Shekelle P, Hopkins R Jr, Forciea MA, Owens DK. Pharmacologic treatment of low bone density or osteoporosis to prevent fractures: a clinical practice guideline from the American College of Physicians. Ann Intern Med. 2008 Sep 16. 149(6):404-15. [Medline]. [Full Text]. 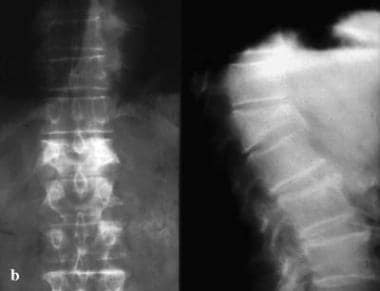 Baldwin KM, Ryb GE, Miller D, Counihan TC, Brotman S. Is spine consultation needed for all thoracolumbar fractures? Evaluation of a subspecialist-sparing protocol for screening and management of stable fractures. J Trauma. 2010 Dec. 69(6):1491-5; discussion 1495-6. [Medline]. Guarnieri G, Izzo R, Muto M. The role of emergency radiology in spinal trauma. Br J Radiol. 2015 Nov 27. 20150833. [Medline]. Inaba K, Nosanov L, Menaker J, Bosarge P, Williams L, Turay D, et al. Prospective derivation of a clinical decision rule for thoracolumbar spine evaluation after blunt trauma: An American Association for the Surgery of Trauma Multi-Institutional Trials Group Study. J Trauma Acute Care Surg. 2015 Mar. 78 (3):459-65; discussion 465-7. [Medline]. Bracken MB. Methylprednisolone and acute spinal cord injury: an update of the randomized evidence. Spine. 2001 Dec 15. 26(24 Suppl):S47-54. [Medline]. Bracken MB, Shepard MJ, Collins WF, et al. A randomized, controlled trial of methylprednisolone or naloxone in the treatment of acute spinal-cord injury. Results of the Second National Acute Spinal Cord Injury Study. N Engl J Med. 1990 May 17. 322(20):1405-11. [Medline]. Bracken MB, Shepard MJ, Collins WF Jr, et al. Methylprednisolone or naloxone treatment after acute spinal cord injury: 1-year follow-up data. Results of the second National Acute Spinal Cord Injury Study. J Neurosurg. 1992 Jan. 76(1):23-31. [Medline]. Ghaly RF. Recovery after high-dose methylprednisolone and delayed evacuation: a case of spinal epidural hematoma. J Neurosurg Anesthesiol. 2001 Oct. 13(4):323-8. [Medline]. Goel VK, Pope MH. Biomechanics of fusion and stabilization. Spine. 1995 Dec 15. 20(24 Suppl):85S-99S. [Medline]. Al-Sebai MW, Al-Khawashki H, Al-Arabi K, Khan F. Operative treatment of progressive deformity in spinal tuberculosis. Int Orthop. 2001. 25(5):322-5. [Medline]. Dimar JR, Fisher C, Vaccaro AR, et al. Predictors of complications after spinal stabilization of thoracolumbar spine injuries. J Trauma. 2010 Dec. 69(6):1497-500. [Medline]. Anderson DK, Hall ED, Braughler JM, et al. Effect of delayed administration of U74006F (tirilazad mesylate) on recovery of locomotor function after experimental spinal cord injury. J Neurotrauma. 1991 Fall. 8(3):187-92. [Medline]. Baron BJ, Scalea TM. Spinal cord injuries. In: Tintinalli JE, Kelen GD, Stapczynski JS, eds. Emergency Medicine: A Comprehensive Study Guide. 5th ed. New York, NY: McGraw-Hill. 2000: 1645-61. Belaval E, Roy S. Fractures, Cervical Spine. Medscape Reference Journal [serial online]. 2002. Available at:. [Full Text]. Benz RJ, Garfin SR. Current techniques of decompression of the lumbar spine. Clin Orthop. 2001 Mar. (384):75-81. [Medline]. Bergman TA, Seljeskog EL. Management of thoracolumbar and lumbar spine injuries. In: Youmans JR, ed. Neurological Surgery: A Comprehensive Reference Guide to the Diagnosis and Management of Neurosurgical Problems. 3rd ed. Philadelphia, Pa: WB Saunders. 1990: 2411-22. Brandoli C, Shi B, Pflug B, et al. Dexamethasone reduces the expression of p75 neurotrophin receptor and apoptosis in contused spinal cord. Brain Res Mol Brain Res. 2001 Feb 19. 87(1):61-70. [Medline]. Braughler JM, Hall ED. Current application of "high-dose" steroid therapy for CNS injury. A pharmacological perspective. J Neurosurg. 1985 Jun. 62(6):806-10. [Medline]. Brockmeyer D. Pediatric Spinal Cord and Spinal Column Trauma. Neurosurgery://On-Call [serial online]. 2000. Available at: http://www.neurosurgery.org/pediatric/ped_spine.html. [Full Text]. Bruecker KA. Principles of vertebral fracture management. Semin Vet Med Surg (Small Anim). 1996 Nov. 11(4):259-72. [Medline]. Collins WF. Surgery in the acute treatment of spinal cord injury: a review of the past forty years. J Spinal Cord Med. 1995 Jan. 18(1):3-8. [Medline]. d'Hemecourt PA, Gerbino PG 2nd, Micheli LJ. Back injuries in the young athlete. Clin Sports Med. 2000 Oct. 19(4):663-79. [Medline]. Dunn ME, Seljeskog EL. Management of thoracic spine fractures. In: Youmans JR, ed. Neurological Surgery: A Comprehensive Reference Guide to the Diagnosis and Management of Neurosurgical Problems. 3rd ed. Philadelphia, Pa: WB Saunders. 1990: 2403-10. Gamble CL. Osteoporosis: drug and nondrug therapies for the patient at risk. Geriatrics. 1995 Aug. 50(8):39-43. [Medline]. Gerszten PC, Welch WC. Current surgical management of metastatic spinal disease. Oncology (Huntingt). 2000 Jul. 14(7):1013-24; discussion 1024, 1029-30. [Medline]. Gray H. Joints and ligaments. In: Goss CM, ed. Anatomy of the Human Body. 29th ed. Philadelphia, Pa: Lea & Febiger. 1973: 109-13. Gray H. Osteology. In: Goss CM, ed. Anatomy of the Human Body. 29th ed. Philadelphia, Pa: Lea & Febiger. 1973: 100-4. Hall ED. Pharmacological treatment of acute spinal cord injury: how do we build on past success?. J Spinal Cord Med. 2001 Fall. 24(3):142-6. [Medline]. Hall ED. The neuroprotective pharmacology of methylprednisolone. J Neurosurg. 1992 Jan. 76(1):13-22. [Medline]. Hall ED, Wolf DL. A pharmacological analysis of the pathophysiological mechanisms of posttraumatic spinal cord ischemia. J Neurosurg. 1986 Jun. 64(6):951-61. [Medline]. Harrington KD. Orthopedic surgical management of skeletal complications of malignancy. Cancer. 1997 Oct 15. 80(8 Suppl):1614-27. [Medline]. Hee HT, Majd ME, Holt RT, Pienkowski D. Better treatment of vertebral osteomyelitis using posterior stabilization and titanium mesh cages. J Spinal Disord Tech. 2002 Apr. 15(2):149-56. [Medline]. Hilton G, Frei J. High-dose methylprednisolone in the treatment of spinal cord injuries. Heart Lung. 1991 Nov. 20(6):675-80. [Medline]. Hsiang JNK. Spinal Stenosis. Medscape Reference Journal [serial online]. 2001. [Full Text]. Hurlbert RJ. The role of steroids in acute spinal cord injury: an evidence-based analysis. Spine. 2001 Dec 15. 26(24 Suppl):S39-46. [Medline]. Hurlbert RJ, Hadley MN, Walters BC, Aarabi B, Dhall SS, Gelb DE, et al. Pharmacological therapy for acute spinal cord injury. Neurosurgery. 2013 Mar. 72 Suppl 2:93-105. [Medline]. Inaoka M, Tada K, Yonenobu K. Problems of posterior lumbar interbody fusion (PLIF) for the rheumatoid spondylitis of the lumbar spine. Arch Orthop Trauma Surg. 2002 Feb. 122(2):73-9. [Medline]. Janssen ME, Lam C, Beckham R. Outcomes of allogenic cages in anterior and posterior lumbar interbody fusion. Eur Spine J. 2001 Oct. 10 Suppl 2:S158-68. [Medline]. Laheri VJ, Badhe NP, Dewnany GT. Single stage decompression, anterior interbody fusion and posterior instrumentation for tuberculous kyphosis of the dorso-lumbar spine. Spinal Cord. 2001 Aug. 39(8):429-36. [Medline]. Larson JL. Injuries to the spine. In: Tintinalli JE, Kelen GD, Stapczynski JS, eds. Emergency Medicine: A Comprehensive Study Guide. 5th ed. New York, NY: McGraw-Hill. 2000: 1792-1800. Lowe TG, Tahernia AD. Unilateral transforaminal posterior lumbar interbody fusion. Clin Orthop. 2002 Jan. (394):64-72. [Medline]. Mehta JS, Bhojraj SY. Tuberculosis of the thoracic spine. A classification based on the selection of surgical strategies. J Bone Joint Surg Br. 2001 Aug. 83(6):859-63. [Medline]. Moon MS. Tuberculosis of the spine. Controversies and a new challenge. Spine. 1997 Aug 1. 22(15):1791-7. [Medline]. National Institute of Neurological Disorders and Stroke. Spinal Cord Injury: Emerging Concepts. 2001. Available at: http://www.ninds.nih.gov/health_and_medical/pubs/sci_report.htm. [Full Text]. Nobunaga AI, Go BK, Karunas RB. Recent demographic and injury trends in people served by the Model Spinal Cord Injury Care Systems. Arch Phys Med Rehabil. 1999 Nov. 80(11):1372-82. [Medline]. Oxland TR, Lund T. Biomechanics of stand-alone cages and cages in combination with posterior fixation: a literature review. Eur Spine J. 2000 Feb. 9 Suppl 1:S95-101. [Medline]. Papadopoulos SM, Selden NR, Quint DJ, et al. Immediate spinal cord decompression for cervical spinal cord injury: feasibility and outcome. J Trauma. 2002 Feb. 52(2):323-32. [Medline]. Rotter R, Martin H, Fuerderer S, Gabl M, Roeder C, Heini P, et al. Vertebral body stenting: a new method for vertebral augmentation versus kyphoplasty. Eur Spine J. 2010 Jun. 19(6):916-23. [Medline]. [Full Text]. Schreiber D. Spinal Cord Injuries. Medscape Reference Journal [serial online]. 2003. [Full Text]. Spinal Cord Injury Information Network. Spinal Cord Injury: Facts and Figures at a Glance. 2001. Available at: http://www.spinalcord.uab.edu/show.asp?durki=21446. [Full Text]. Stambough JL. Posterior instrumentation for thoracolumbar trauma. Clin Orthop. 1997 Feb. (335):73-88. [Medline]. Tan SC, Harwant S, Selvakumar K, Kareem BA. Predictive factors in the evolution of neural deficit in tuberculosis of the spine. Med J Malaysia. 2001 Jun. 56 Suppl C:46-51. [Medline]. Taoka Y, Okajima K, Uchiba M, Johno M. Methylprednisolone reduces spinal cord injury in rats without affecting tumor necrosis factor-alpha production. J Neurotrauma. 2001 May. 18(5):533-43. [Medline]. Ullrich PF. Spine Topics. 2001. Available at: http://www.spine-health.com/topics/topics01.html. [Full Text]. Vaccaro AR, Silber JS. Post-traumatic spinal deformity. Spine. 2001 Dec 15. 26(24 Suppl):S111-8. [Medline]. Wetzel FT, Phillips FM. Management of metastatic disease of the spine. Orthop Clin North Am. 2000 Oct. 31(4):611-21. [Medline]. Wilson DJ, Owen S, Corkill RA. 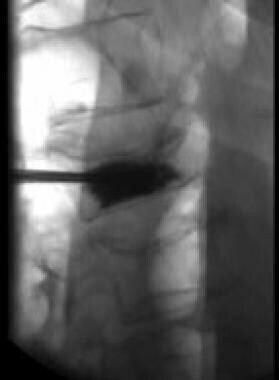 Coblation vertebroplasty for complex vertebral insufficiency fractures. Eur Radiol. 2013 Feb 27. [Medline].